Today went by fast, that’s for sure. I spent the morning agonizing over whether my Girl Scouts would need to do the flag-raising ceremony that I’d agreed to do before losing the one person who could really do it well. I was cheering for the rain this morning like most people cheer for football teams. Then, saved by the weather, I went from a back-to-school day to a back-to-school shopping day, where a locker shelf was needed, and then a backpack at the next store, and then apparently some jeans and two dresses. And then it wasn’t long after dinner, and the fashion show, and the Annual School Supply Labeling Extravaganza that it was time to jump into Obamaland, as brought to you by the Democratic National Convention and PBS. But it’s still Thursday, and here are three beach books for the last of the summer days. I heard great things about this book and I had to see it for myself. As it turns out, I could have waited for the movie. 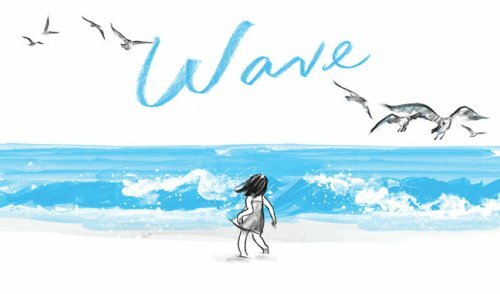 Truly, this is a beautiful book wordlessly chronicling one girl’s encounter with the ocean. The book’s gutter gives a sense of a barrier between the cautious girl and the playful waves. As she gets braver and feels more invincible, she finds that the ocean has many surprises. A lovely summertime book combining light charcoal sketches and brilliant blue-painted sea. 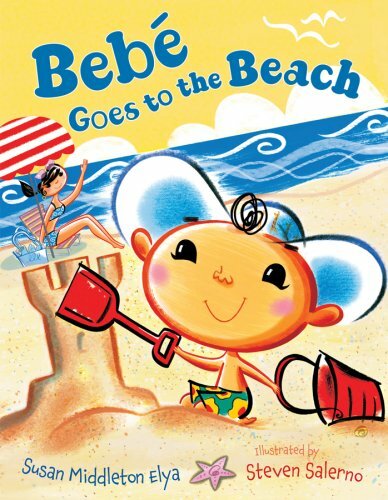 Bright, stylized illustrations put Bebé and Mama at the beach following their previous shopping trip. Spanish words are used throughout the rhymes, often with context and pictures explaining the meaning of the words. (If you get stuck, there is also a glossary.) For instance, take this couplet: “He’s wearing his gorro with fuzzy jirafas./Mama parks her silla and puts on her gafas.” You could make some good guesses, but it’s certainly easier with Bebé sporting a hat decorated with giraffes as mom puts down her chair and puts on her glasses. In this story, it seems that the baby is a bit of a handful zipping around the beach, but mom still gets a chance to have fun with her son. I loved the art of Duck Skates, so I was all psyched for the new title. I enjoyed the cute story as five ducks head to the beach and swim, snack, play, and fly kites in a gorgeous blue sky over an aquamarine ocean. 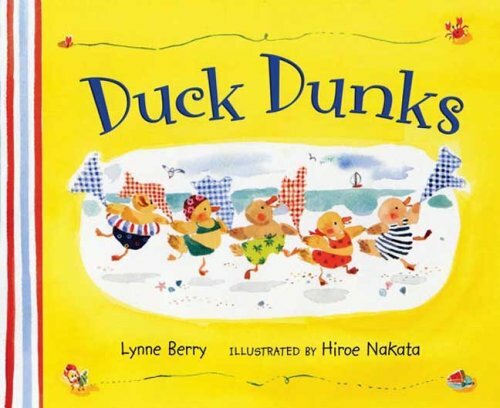 Light and easy sing-song rhymes keep the book fun: “Five little ducklings, hand in hand, skip from the boardwalk, into the sand.” Fun book for preschoolers and anyone who likes really cute ducks. I mean, they are really cute ducks.